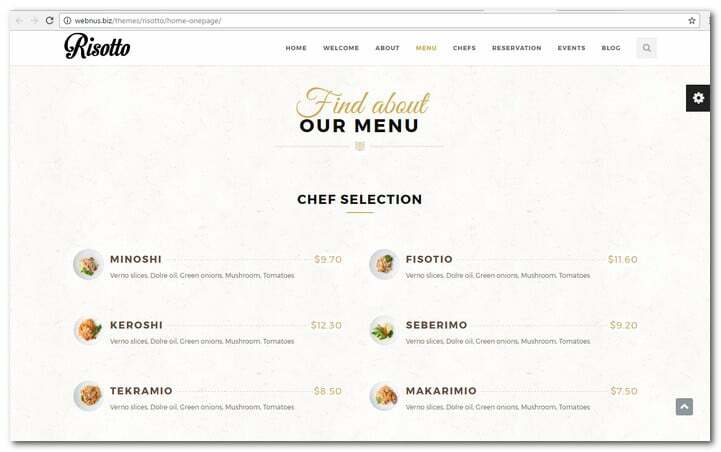 Restaurant Menu Templates – It’s Time to Get Famous! 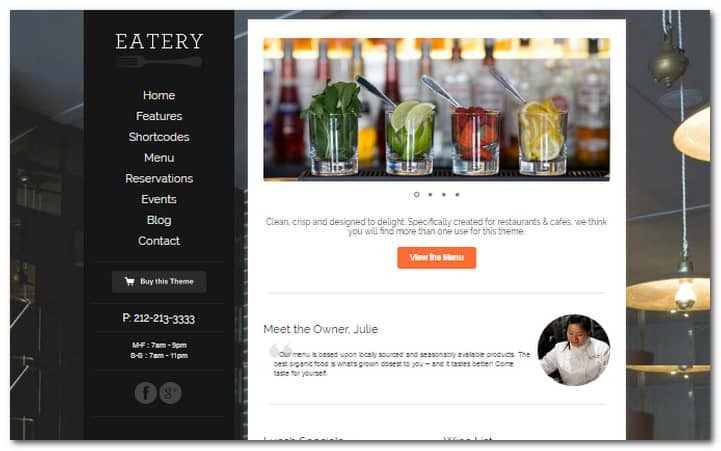 Restaurant Menu Templates for WordPress are popular these days. Restaurants, cafes, bars and coffee shops create websites and a menus for their businesses. WordPress is a popular platform which provide a rock solid solution for this purpose. WordPress is an easy to use Content Management System (CMS). You might already know it? 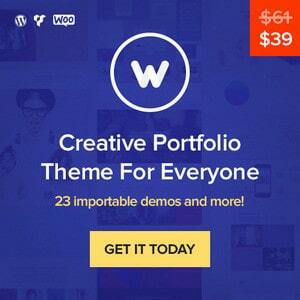 It has an incredible amount of themes and plugins available to help you succeed. Running a successful restaurant is exciting and demanding. You have to serve your customers and make them feel special in your restaurant – every single day. 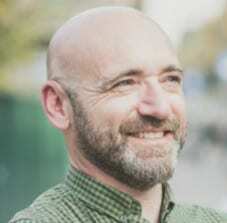 In addition, it is also critical to have good online presence in the search engines and social media. Your online presence should of cause be branded towards the type of food and the locations you serve. The menu and images showing the delicious food is of course essential for your website. 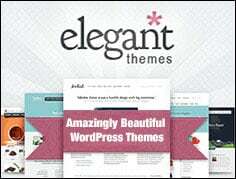 To make things easy you should choose a WordPress theme prepared for this. You also have to make sure that your restaurant website has the right functionality. 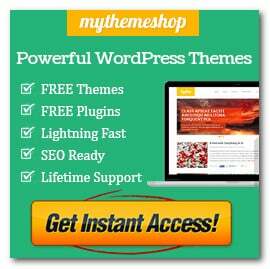 If your theme is missing some features you can most likely add these with a WordPress plugin. Maybe you want to send professional email newsletters or add a cool calendar widget? 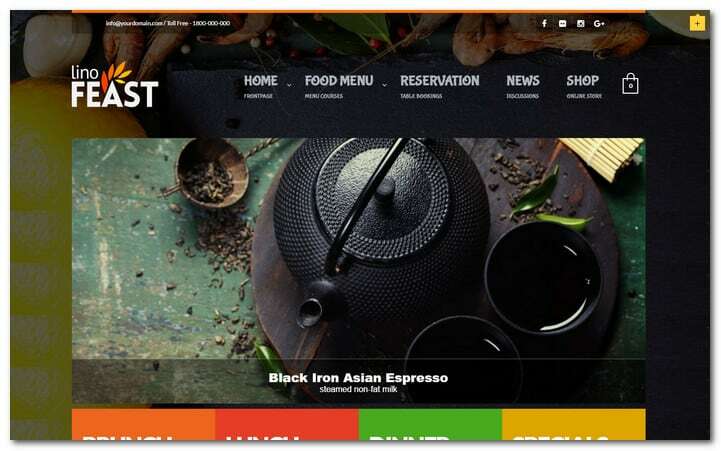 In this article you will find some of the best restaurant WordPress themes. 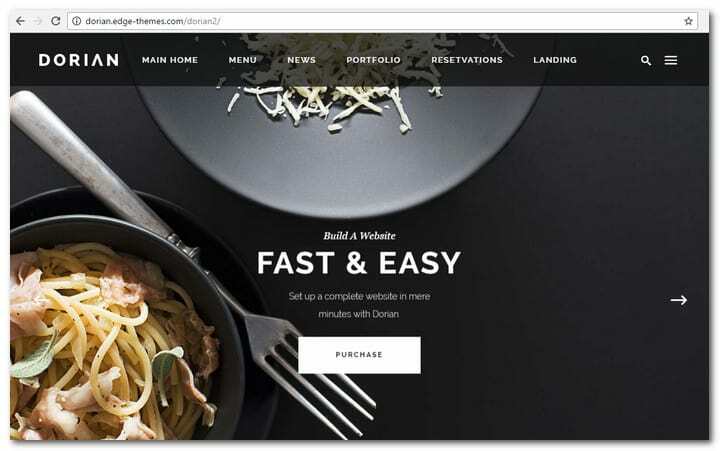 Before you dive in take a look at this video showing you how to build a restaurant website from scratch. A restaurant website should look great. People looking to dine will judge the quality of your restaurant based on your website. You may be missing out on potential customers if your restaurant haven’t got a website yet. It’s time to put a compelling description of your restaurant, your menu and business hours online. This way more people can find you. Check below and pick your favorite. Please share your opinion in the comments below and tell if your like the themes. I hope you enjoy this tour! 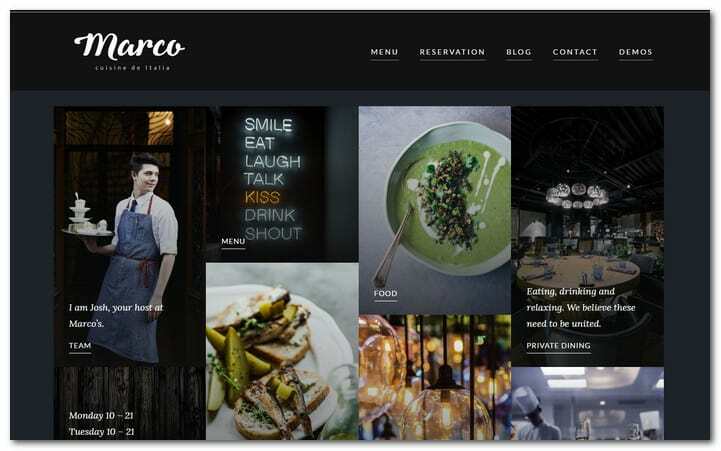 Marco is a modern restaurant theme for WordPress that is extremely functional and unique. It is ideal for all kinds of café, sushi bar, winery, bar, bistro, pub, restaurant and other food related websites. You will find the stunning design of Marco modern restaurant WordPress theme to be something you can be proud of. It provides every vital restaurant features that may be needed by food business websites. These include gallery, menu, contact, blog, team and online reservation. 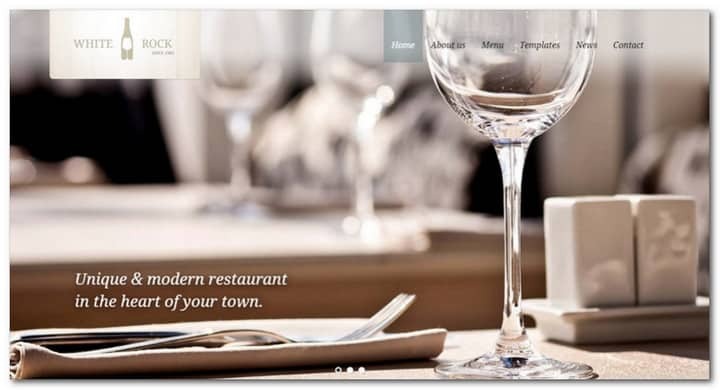 In fact, this WordPress theme is all that you need to start a restaurant website in minutes. To have a firsthand glimpse of this theme, please visit the demo page via the product link we have included above. Take note that the templates do not come with pictures. 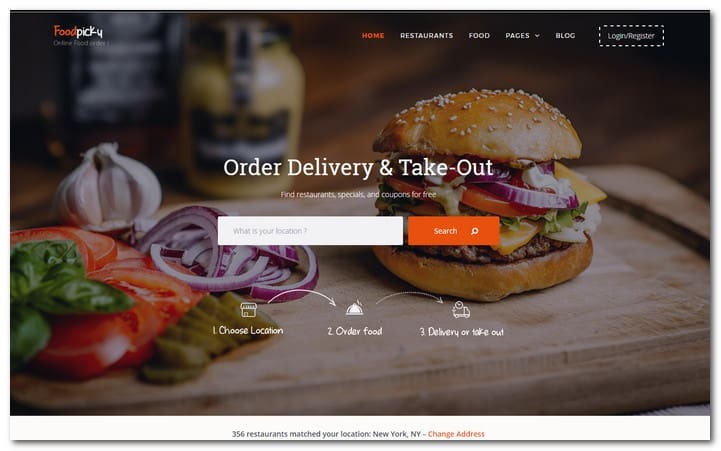 FoodPicky is a food delivery restaurant directory theme for WordPress that is best for food delivery and ordering system like JustEat, FoodPanda, Eat24Hours, Grubhub, DoorDash and delivery.com. you can use this theme for one restaurant. All you have to do is to label the profile page as Our Menu then take away all unimportant sections through the page builder. The flexibility feature of this theme includes a fully configurable footer, sidebar and header. It has submission form that can be configured through CMB2 API as well as search and filter form and sorting that are also configurable. The item templates on both single and list pages can be configured as well. Other features of this theme include custom fields, custom sorting, field able item layouts, frontend submission and editing, frontend WC variations submission, purchase commissions for listing owner, subscription payments for listing submission and more. Dorian is a refined multi concept theme for WordPress has a user friendly but powerful admin interface. It provides single click demo import as well as 221 homepage examples. The inner page templates contained in this theme are stunning and it has a huge collection of custom shortcodes. The other features of Dorian WordPress theme include Edge Slider with video and image support, Zoom animations for Edge Slider images, Edge Slider parallax effect, different slide animation types, infographic shortcodes, vertical split slider shortcode, expanding images shortcode, interactive icon showcase shortcode, cascading images shortcode, frame slider shortcode, Icon Chain shortcode, image gallery shortcode, numbered tile shortcode, item showcase shortcode, custom font shortcode, restaurant menu shortcode, animation holder shortcode, 3 header types, multiple header behaviors and more. Pearl is a restaurant and hotel WordPress theme that is both creative and modern. 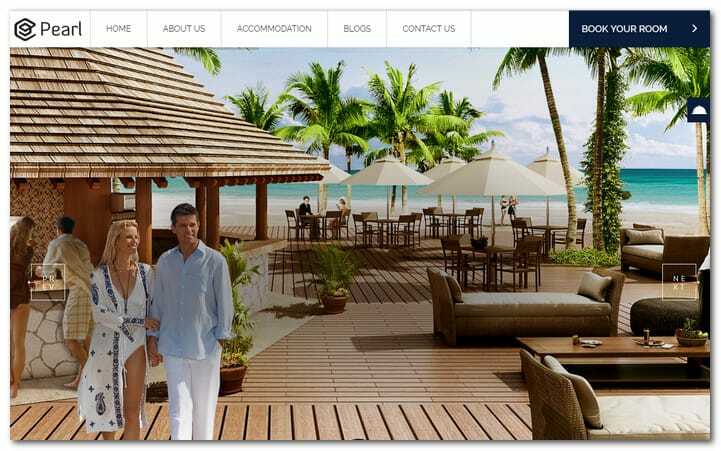 It is the ideal theme to have for hotel, online order, room booking, food, restaurant and similar websites. Pearl has all the features that you will need to launch a website on a weekend. It has stunning menus, galleries and open table reservations that are only several clicks off. Pearl also has Table Booking, which allow users to book a table on the internet. The booking is shown to the administrator from the backend. There is also notification for bookings via email. In addition, the theme has events management and WooCommerce integration. The features of this theme include robust room booking module, room with multiple optins, room types managements, email templates, notifications for booking, services and facilities management, hotel branches and more. Risotto is a brand new and already very popular Restaurant & Cafe Theme. It is fully responsive, fast loading and Retina-Ready. The design is very nice and perfect for Food, Restaurant and Cafe websites. The theme is packed with useful features. You will get a easy to use options panel, drag and drop page builder and useful shortcodes. If you like to it is also possible to customize live and the theme fully integrated with the visual composer. 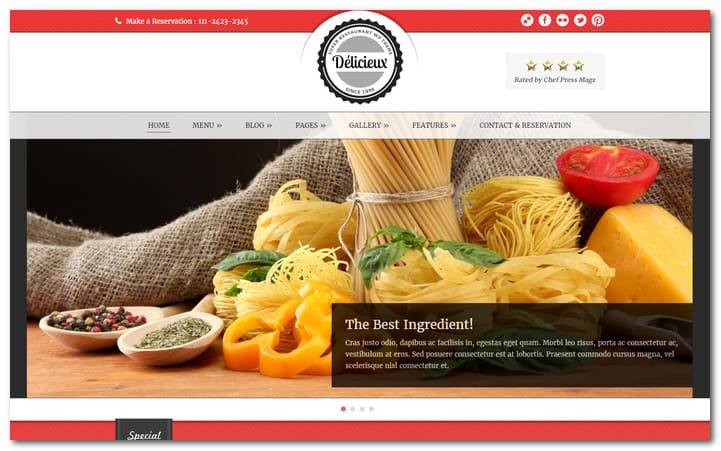 Delicieux is a perfect theme for a restaurant website. It comes with very nice and friendly design and you will have an extensive admin panel. It has tons of features like the page builder (drag & drop), localization supported and optimized for SEO. MyCuisine is delicious, offering up some eye-catching visuals wrapped in a Tuscan shell. It is a small-business theme built with Restaurants in mind. Yet the theme can easily be adapted for any business that desires a cool, vintage look for the website. Clean, crisp and designed to delight. Created specifically for restaurants and cafés, Eatery comes with a full menu system, 6 premium color settings, and a variety of customization options. 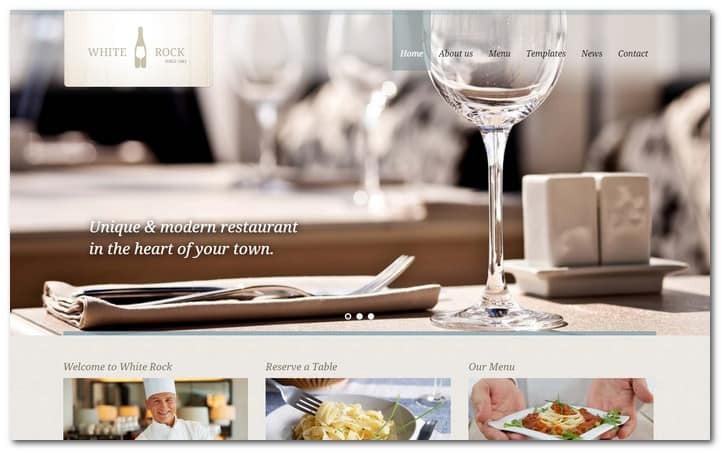 White Rock is a easy-to-customize and fully featured WordPress restaurant theme. It has a detailed help file and comes with a lot of relevant features. Unlimited color schemes, responsive layout and 1 and 2 column menu templates. Custom widgets for Contact Information, Restaurant Hours and Twitter Feed & Flickr Feed. Linguini is a perfect theme for the restaurants, and wineries. It is also suited for pubs, bars and other companies offering foods and drinks. It comes with an excellent system for menu cards (food menu, drink menu) and photo galleries. The theme is highly optimized for search engines and has excellent SEO options. You can add your own keywords and meta descriptions for each page, post or menu item. 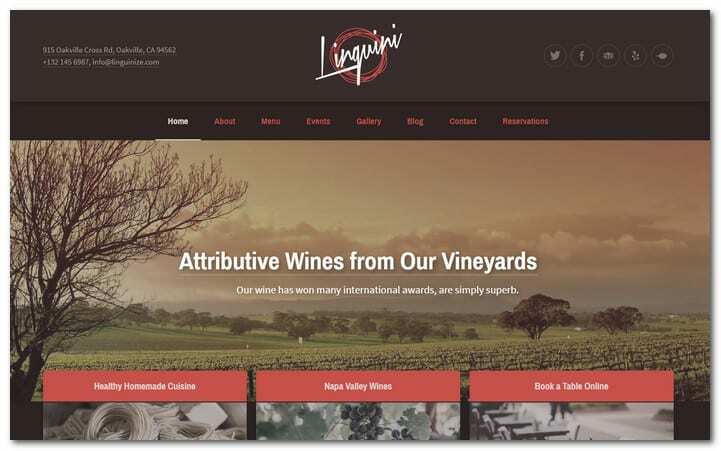 Linguini is a fully responsive theme for WordPress and it looks great on all devices. 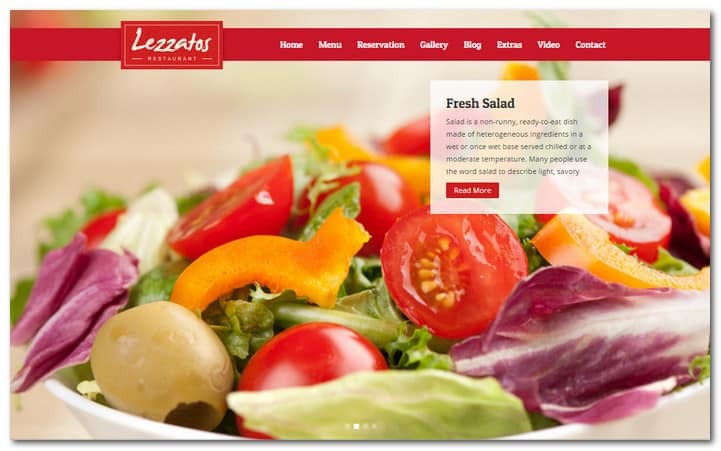 Lezzatos is the WordPress theme for cafe & restaurant. It’s very easy to use even for beginners. Equipped with custom post “menu” and reservation form. This theme also highly customized, you can change website look just by clicks. LinoFeast is a powerful theme with many features. It is easy to edit even without programming knowledge. It empowers you to change any color of elements. You can customize background, texts, links, menu links, typography etc. With a responsive design it’s compatible with all devices. Try resizing your browsers to see different layout option. You can watch the site in iPhone using the QR Code in the Screenshot to see perfect responsive design. Beautiful design and easy to use Orange Themes Control Panel makes this WordPress theme a good choice in business. Featuring great looking menu card design with multiple page support and table reservation system. It also can be easily customizable thanks to valid HTML code, which means you can adopt this theme for you blog or other type of website. 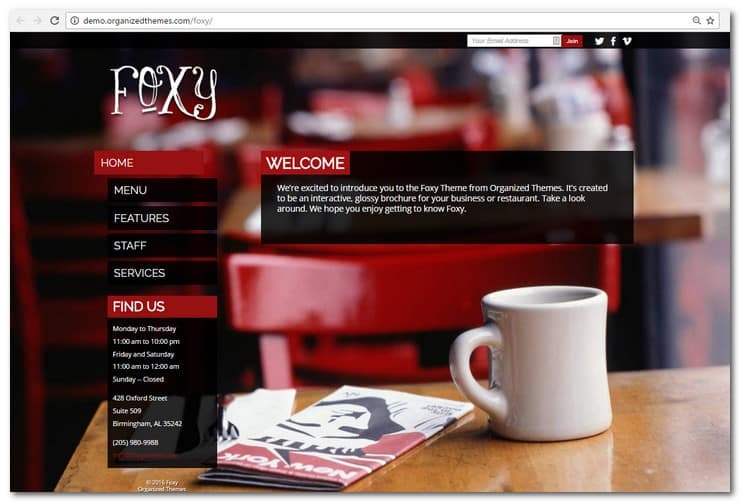 Foxy is a unique WordPress theme that’s perfect for restaurant sites. You can impact your visitors with big, bold images. Immediately the full-size background images catch your attention and pull you into the site. The backgrounds are easy to customize and can be a slideshow (with 7 transition effects). You can use a specific image or a random image with every page load. 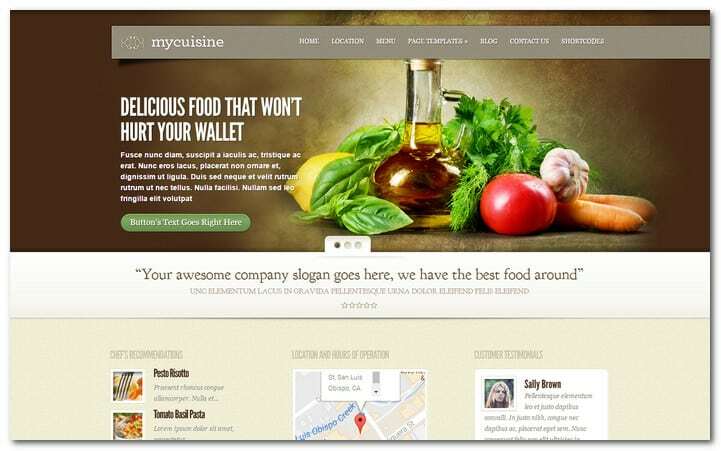 Thanks for sharing such a beautiful collection of restaurant templates. I like to recommend one more food based theme that is FoodFork. It has custom menu card, customizable mega menu, unlimited theme colors, fully widgetized home page and many other attractive features included with it. great list amazing theme for restaurant.. i love Lezzatos.. I like the theme Pluto, for my restaurant is an elegant and useful template. I like WordPress, but some templates aren’t friendly with the speed test of Google. For this reason, I use now Genesis. With this theme I obtain a 93 points in the score of Google. Look and test this page: http://www.tramite.co/consulta-fosyga-bdua-y-fosyga-afiliados/ (This is Genesis, and the score is 93 points in desktop)… This is a rocket! Thanks a lot for these. I’m looking to build a restaurant page for a pizzeria here and it’s tough choosing the right template. These helped a lot. There are plenty of options out there for restaurant owners. The true value comes with someone that can install the template for them. Very customizable templates. In the modern spirit, according to guarantee a good position. With minimal effort, made ? ?at the proposed site templates can be functional veil. Thanks. 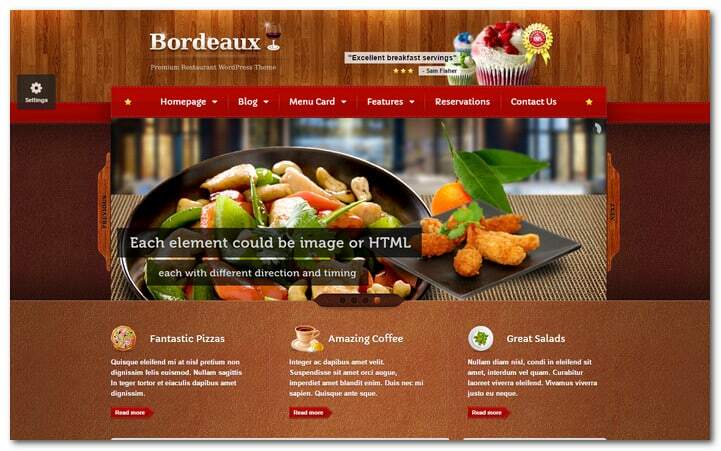 Thanks for Sharing the Restaurant Menu Templates for WordPress. Your making me hungry =). nice list! It has various styles, flat design, illustration, even heavy design. Nice design and good tutorial for making a brand. I like it. It’s a good overall list, however we’d like to see more designs catering for the oriental restaurant market please. These are awesome I could look at them for hours. (Luckily I am full now – or else this would be another story). 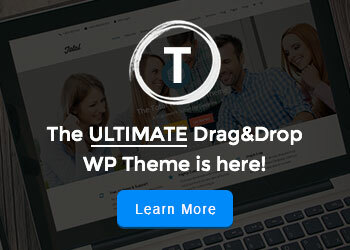 Very nice Templates and Themes! Thanks a lot for posting this very useful and helpful article. Keep going on with high quality articles like this one! I pesonally like Bottega theme the most. From the restaurant visitor point of view it offers great presetation pics on homepage as well as lots of practical info easy to squeeze on..
nice designes … good to make a brand .. Thanks for sharing. The theme s are really awesome. I am still on blogger platform but i am launching a second blog on wordpress. Foodpress is a good looking theme but it does not allow you to create a child theme (pretty basic requirement I would think) and there is NO SUPPORT on the support site. 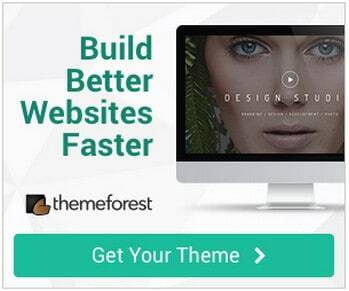 Unless you are an expert that does not need any help at all, do not buy this theme. I would second the advice not to buy. The theme, as you say, cannot be given a child theme, due to poor code. More importantly, the theme is not compatible with the latest version of WordPress, so there’s no way forward with it. I also discovered many bugs in the code. The author has now given up any pretence of support. I liked the themes, do these themes are optimized for hand held devices. Some really nice sites but find that while many of the templates have great layouts I find many are themed a certain way with limited style options and as most restaurants are strongly branded its hard to find the right match. Are there any blank canvases or frameworks specifically for restaurants that offer more options on the design side. It allows for unlimited menus, menu categories and menu items for $10. It can conform to your own CSS or you can customize the CSS file. Thanks for sharing you experience – it is a good tip and I’m glad you find the article valuable. I’m running http://kitchen.net and have been looking for themes to my restaurant clients, specifically wanted themes with easy menu option for the client to maintain themselves, just checked out your plugin Raz but it seems that the site is now forsale and no longer exists. Yes, i found it! i will use this for my client 😀 thanks a lot buddy. These are all very nice themes, we created one as well, which would make a great addition. Please consider adding it to your list as well, thanks in advance! Wow! Nice collection of templates. Just what I was looking for. Now I have a hard time selecting the one I want to use. Thanks. Oh, and the chowforce link isn’t working. I have installed Paradiso, Pizza & Pasta template at my word-press blog and believe me its best for pizza parlor sites.. I love most of these, the photo fullscreen one just wins it for me though, perfect for a client’s restaurant I have photographed my self. Thanks for sharing the great themes. I love the chocolate and coffee theme! Great themes, thank you for these! Hi Samtat – thanks for sharing. The Pingwire link is dead. Thank you admin for these great resources.